← We are on the way to Berlin- 15 days to go! We arrived in Munster on Tuesday, intending on staying one night. 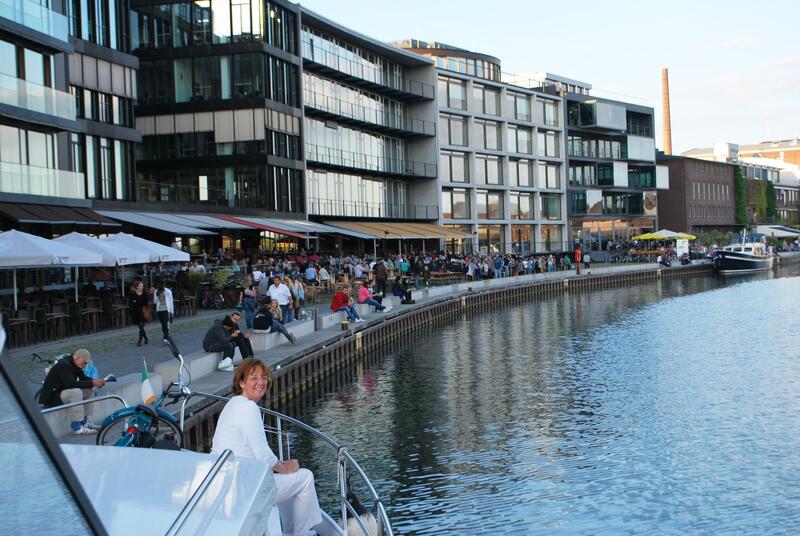 We took a chance and went into the main town harbour instead of going to the local marina. While it was not an official mooring site, we saw one other boat and decided to stay. There was no electricity or water but it turned out to be an inspired decision. By that night, five other boats had joined us and the place was buzzing as the cafes and bars along the waterfront were filled with people. As I said in a previous blog it was like been in the middle of the IFSC in Dublin (for our non-Irish readers, the Financial Centre in the middle of Dublin – very up market). Munster turned out to be a lovely city with a long history and we ended up staying two nights. It is an ancient walled city and has seen many wars and changes over the centuries. At one stage the entire town converted to Protestantism, called Anabaptists, set up their own kingdom and currency. In 1535 the resident Catholic bishop’s troops bombed the town, over ran it, had the Protestant leaders tortured and hung in wire cages from the cathedral tower as a warning to others and turned it back to Catholicism. Also Munster City was the location at which the Peace of Westphalia was signed in 1648, ending the seven year war and creating Holland as a country. 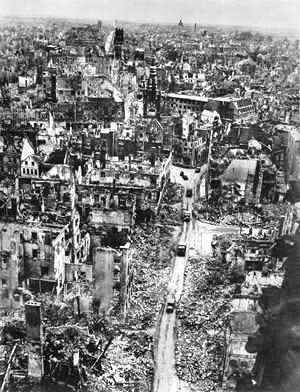 Munster is in the middle of the German industrial area and during WW2 it was subjected to very heavy bombing. The city was wiped out and they have faithfully recreated it. I am beginning to understand the miracle that happened in Germany after the WW2. The country was totally devastated but by hard work and the visionary policy of USA, who lent the German people the money to rebuild, they put the country back together within about 5 years. It’s hard to believe walking around Munster that most of it was recreated around 1950. I think we have a lot to learn from that generation-what you can achieve if you put your mind to it. Munster is a city of bikes, it’s called the bike capital of Germany. One quarter of all journeys in the city are done on bikes. The city is totally set up for bikes and they have priority. Other road traffic is totally aware of bikes and you feel safe cycling there. 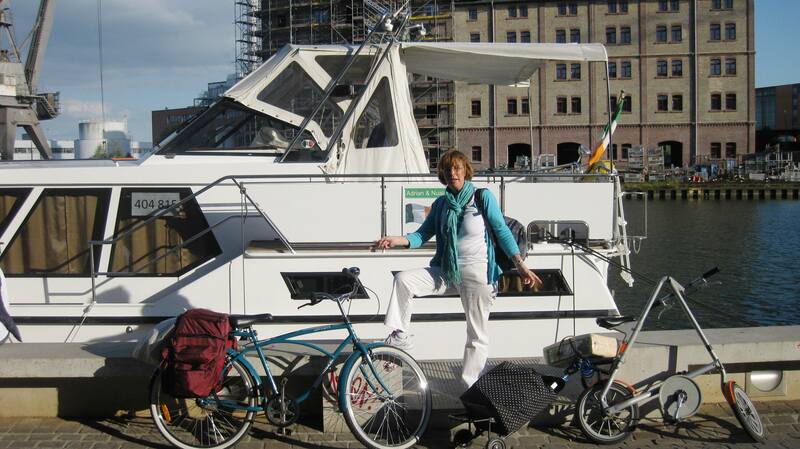 We were right at home, as with our bikes we were able to cycle everywhere. There were saddle bags on many of the bikes and Nuala decided we had to get one. We searched long and hard and after she had finally given up and we were on the way back to the boat, she found a charity shop. 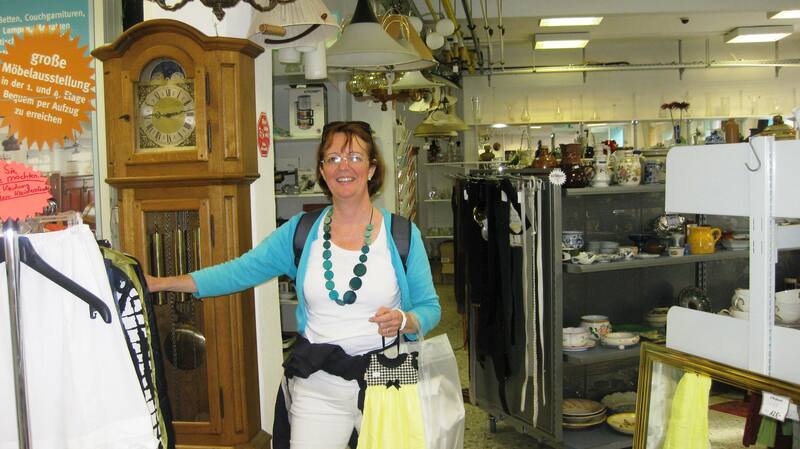 (Anybody who know Nuala well, knows that she loves charity shops- I think the takings in the SVP shop in Sean Mc Dermot St in Dublin must have gone down by at least 10% since she is away). In she went and among a load of things she bought was a saddle bag for €5. We spent a total of €11 and that was because we only had less than half hour to shop, as it was closing. We did not find any charity shops in France, does anyone know why? 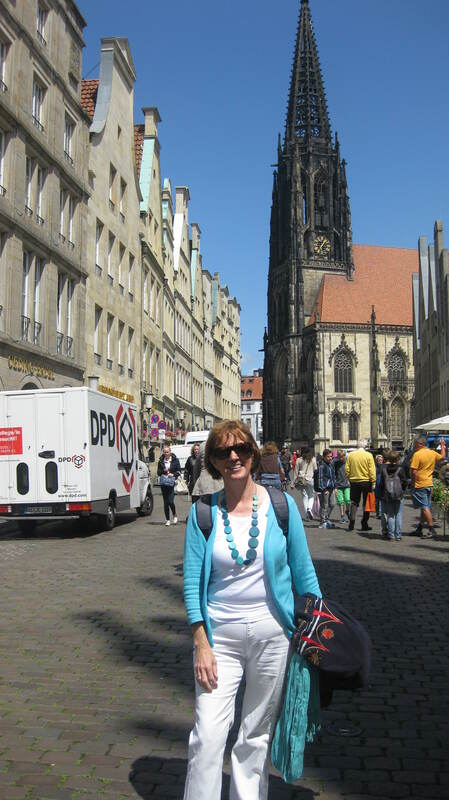 We were reluctant to leave Munster but feel we need to press on to our final destination – Berlin. But as part of the objective of this trip we are beginning to get a better understanding of the German people and they are great- so helpful and caring. This entry was posted in Comments on Social Economic Lifestyle in France, On the Journey, Places visited and tagged Anabaptists, Charity shops, Munster - City of Bikes, Munster City 1945, Munster City Germany, Peace of Westphalia, rebuilding German cities, SVP, SVP Sean Mc Dermot St, The German Miracle, Westphalia Region, WW2 bombing of cities. Bookmark the permalink. Hi guys! So enjoying your blog. Can’t speak for France but here in Greece no charity shops exist to this day. When I first came here, I spent many an hour trying to explain the concept of how they were run only to be met with a look of horror on explaining that everything in them was second hand and had been used/ worn by someone else at some stage. They could not abide the thought even for a second! In fact the whole issue of charity is a big issue here. The expat community has been at the forefront of setting up many of the existing charities alongside prominent Greek society but getting people to volunteer and give up their time is a battle and a half. There’s still a long way to go ……..
Great that you are following us. Yes we have found it hard to understand why they dont do it.